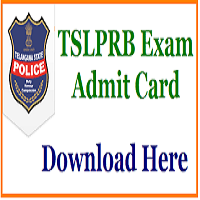 Dear job seekers, now read this update to Download TSLPRB Hall Ticket 2019. Telangana State Level Police Recruitment Board conducts the selection process of Sub Inspectors, Assistant Sub Inspector, and Constable Vacancies. This state-level selection begins in a few days from now and consists of Physical, Written, and Medical Tests. The applied contestants should read further to know examination dates and proceed to Download Telangana SI ASI Constable Admit Card from here. Recently, the state authority on behalf of the State Government had invited eligible candidates to apply for various available positions in the policing department and fire departments. There are around 10150 vacant seats for the current recruitment and open for Male and Female candidates. Those suitable for applying have completed their registrations and are ready to attend the selection phases. Get ready to participate in the contest as the Telangana State SI ASI Constable Exam Date is available. Please refer to the following details mentioned to inform all the contestants. As clear from the official notification, there will be a four-phase selection process for these posts. Lakhs of aspirants have filled their application forms and will participate in the exams. First, a pre-examination shall be carried out to select the eligible ones and later on, the next phases of selection shall follow up. More details and event information is described on Telangana State Police SI ASI Constable Admit Card. Kindly, check the same properly. This test is carrying Multiple Choice Questions. The written exam is carrying 200 questions with one mark each. Subjects included in the test are: Mathematics, English, Science, History, Geography (India/Telangana), Reasoning and Current Affairs. The examination is based on Intermediate Level. The test will be available in English, Telugu, and Urdu. This exam will be held in a subjective mode and will also carry 200 questions. The rest of the subjects are going to be the same and are also based on Class 12th level syllabus. The paper shall be ins English, Telugu, and Urdu languages. A separate Personality and Intelligence test shall be held after the completion of the final examination and Physical tests. Reach the examination venue timely as said in the Hall Ticket. Latecomers shall be restricted to enter the examination premises. Use of mobile phones, smart-watches, digital watches, calculators, and other electronic media is not allowed during the written test. After reaching the homepage, refer to the TSLPRB Hall Ticket 2019 job categories displayed there and follow an updated link. According to the applied job profile, follow the admit card link and get to the login page. Input your login details like Registration Number and Date of Birth or Password. Hit the submit button and print your Admission/Entry Ticket. Take a hard copy along and keep one safe for future reference. Follow the instructions as specified above and reach the official web page to download TSLPRB Hall Ticket for SI Constable Examination online. Also, please keep checking this authorized link to collect all the relevant details regarding the selection process. Leave your message in the comments box to have further queries or gather time-to-time updates. The link that Matters: Download TS Police Hall Ticket from Here Sub Inspector, ASI, Constable Recruitment Exam.